Feed capacity is 67 pounds, over a sack of feed! The Holy Grail of treadle feeders is one that an entire sack of feed can be dumped into at once. Actually you are better off with two feeders that accept a half sack, twice the space for birds to eat, but I can see the attraction of dumping a sack in a feeder every thirty days. 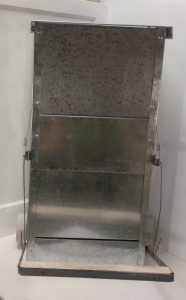 The extra large rat proof treadle chicken feeder hopper holds 67 pounds of laying pellets or other feed and has a 100% galvanized sheet metal feed tray and hopper so the feed flows easily and sanitation is assured. Generally a laying hen eats around 4 ounces of feed per day, so one pound of feed should feed four birds one day, 7 pounds per week per four birds, or 9.5 weeks per full hopper of feed for a four hen flock. That is nearly two and a half months… The more poultry feeders you have the more birds can be fed per poultry feeder. The feed box is about 10.5” deep x 14.5” wide x 30.5” tall, the overall foot print is 21.5” wide x 19.5” deep x 30.5” tall. The shipping box is 33” x 12.5” x 16.5”. It ships as an oversize package and dimensional weight up charges will mean this package ships at around 36 pounds. Figure $52.00 to ship from Oklahoma to Modesto CA. There will be only one version of the extra large feeder, an exterior soft close version. The first shipment of extra large feeders arrived in February. 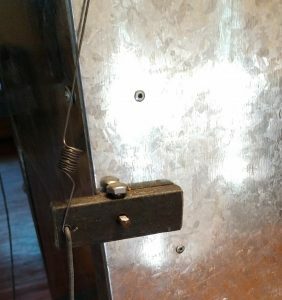 One piece steel bar treadle with an attached distant and narrow treadle which gives the maximum amount of rat proofing. This feeder isn’t designed for for smaller birds due to the increased door width and extra counterweight. One of the new features of the large and extra large feeders is a series of four holes to insert the spring into to make it more adjustable than earlier models. Two of the holes are up under the lid flange and can’t be seen in the picture. The picture on the left is one of the original prototype feeders with the old style axle. All extra large feeders have the heavy duty double end door axle/crank system. Here is a link to the assembly video for the extra large feeder, also the same as the large feeder as the only difference is 10″ extra height. Why it was difficult to add a larger feeder? This feeder is more expensive due to the added complexity of manufacturing and the added bulk adding to the already crazy shipping costs due to feeders being oversized packages. 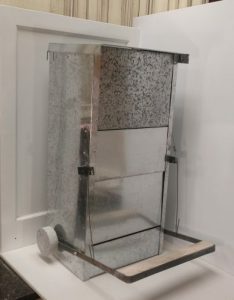 While the feed capacity went up 257%, so did the cost, from $65.00 to $182.50 for the exterior soft close feeder, but I had always held that it would be cheaper to make and purchase two medium feeders rather than produce a large version and I was close to that estimate. Then again some coops simply don’t have the room for two feeders so the new 14.5″ width will feed more birds than the original 10.5″ width. The estimated shipping did go up as expected, the large version would cost $50.00 to ship to Modesto CA versus around $32.00 for the medium feeder. Yet that was cheaper than sending two feeders.. The remaining issue was the sheer weight of 63 pounds of feed. I always assumed that adding 242% weight meant increasing the sheet metal gauge to carry the load and we were already at the limit that the workers, some of which are girls, could hand punch during assembly. 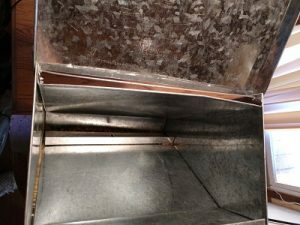 To get around that I added an adjustable throat down inside the bottom of the angled feed hopper and added folds to the end of the feed tray to stiffen it as well as adding a 1/2″ wide flange on the top of the adjustable throat plate. That does impede the flow of feed but that is why the throat needed to be adjustable so it balances out nicely. We have duck or turkey steps for this feeder. There are two different SKUs, one with freight added if you order it by itself, the other with no shipping costs if you are adding it to a feeder order. 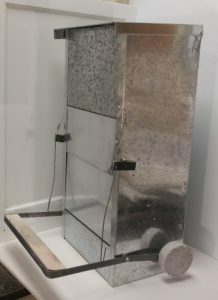 Both the Large and the Extra Large feeder uses the same replacement wire link and same spring as the medium and small feeder. Remember that you need to be able to maintain a feeder like this and tweak it a bit after assembly. Watch our many videos on assembling and if you have limited assembly skills plan on finding a handy friend or family member to help on the assembly and adjustment. As always with our feeders, minor dings and bends are NOT cause to send a feeder back. 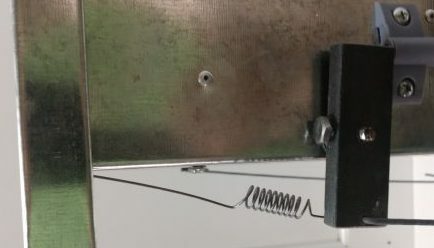 If the dent or ding interferes with the operation of the feeder we will ship you replacement parts at our cost to replace the defective part if it can’t just be bent back by hand or hammered out. These feeders are expensive enough to ship without hitting FedEx Ground with claims for cosmetic damage to feeders and driving our shipping costs up. If you have OCD please purchase from another company!.